KL Rahul of Kings XI Punjab scored his first hundred in the Indian Premier League. The right-handed batsman scored his century against Mumbai Indians in Match 24 of Indian Premier League Season 12. Rahul took 63 balls to score his hundred and remained unbeaten on 100. Thanks to Rahul's knock, Kings XI Punjab reached 197/7. MI vs KXIP, Live Cricket Score of IPL 2019 Match. Rahul's innings included six 6s and six 4s. Rahul was really brutal at the end and scored 22 of just four balls of Hardik Pandya in the 19th over. 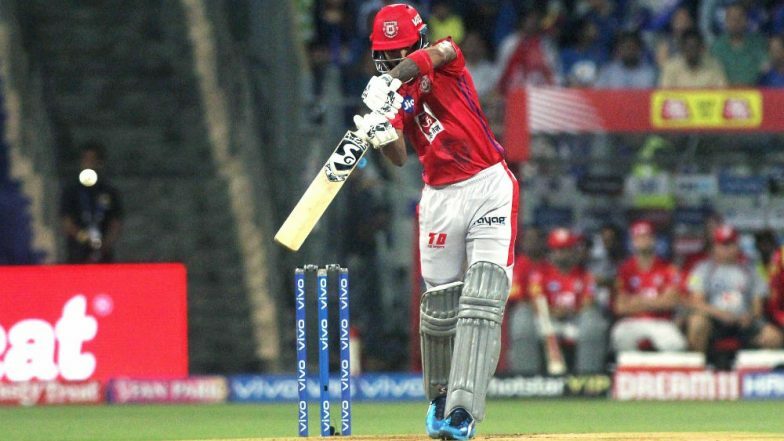 KL Rahul and Chris Gayle shared a partnership of 116 and laid the foundation of an imposing total. Rahul batted through the innings and remained unbeaten. Kings XI Punjab vs Mumbai Indians Live Cricket Score 24th T20 Match. Mumbai Indians Playing XI: Quinton de Kock, Suryakumar Yadav, Siddhesh Lad, Krunal Pandya, Ishan Kishan, Hardik Pandya, Kieron Pollard, Rahul Chahar, Alzarri Joseph, Jason Behrendorff, Jasprit Bumrah. Kings XI Punjab Playing XI: Chris Gayle, KL Rahul, Karun Nair, Mandeep Singh, Sarfaraz Khan, David Miller, Sam Curran, R Ashwin, Hardus Viljoen, Ankit Rajpoot, Mohammed Shami.